Again no point in sales projections using days of the month. It's Christmas time, only a handful have a presents budget of half a million dollars. No point in doing a sales projection when sales drop off so quickly in the later weeks of December. Should be between 300 and 330 according to last year's performance. A quick note on construction. 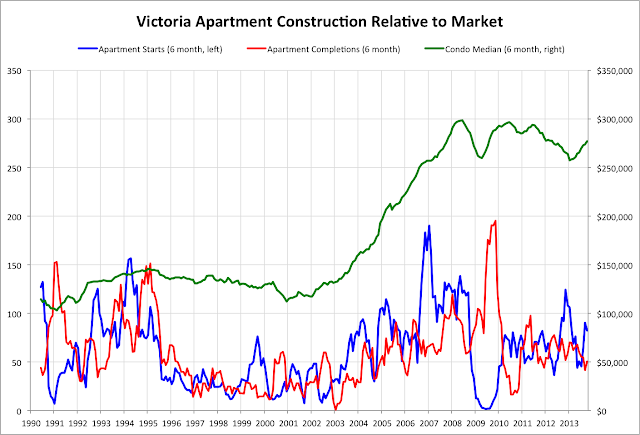 Here are the condo starts and completions over the last 23 years. The condo boom in the early 90s, when we were building some 75 units a month. That was when the term leaky condo still made you think of defective prophylactics rather than building envelopes. The aftermath when completions dropped down to 25-30/month for almost a decade. And the market recovery in the 2000s, leading to first a pickup in building, and then a period of over exuberance in 2007/08 when credit was flowing like water. The current levels is what I found interesting. The price of condos have flatlined and are significantly down from their peaks in 2008. 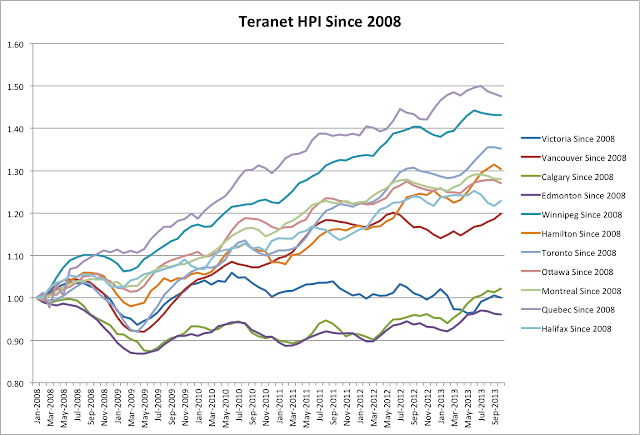 You can likely ignore the small rebound this year, the MLS HPI shows a dead flat market amongst condos. And yet despite this miserable market, condo building is going strong. Some 70 units a month are sprouting up and there is no sign that builders are getting tired of it. We've seen some evidence of older condos being hit pretty hard by all the new construction, and I think at the current rate of building we will continue to see declines. 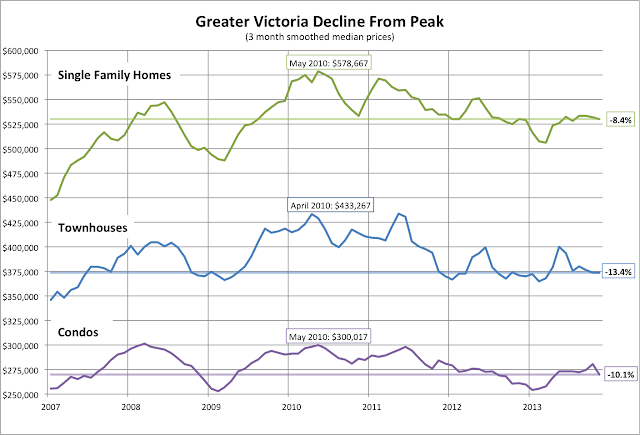 Last time I said that the Victoria market was almost the weakest in Canada since 2008. Of course it could be that the market here has just been weak to compensate for above average performance in the decade before. 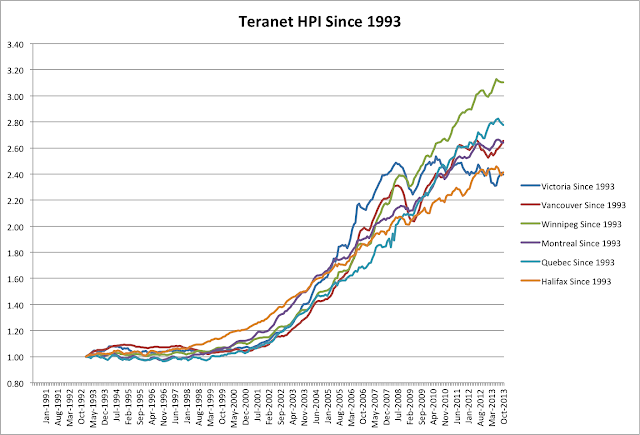 Well since we have Teranet back to the early 1990s we can take a look. 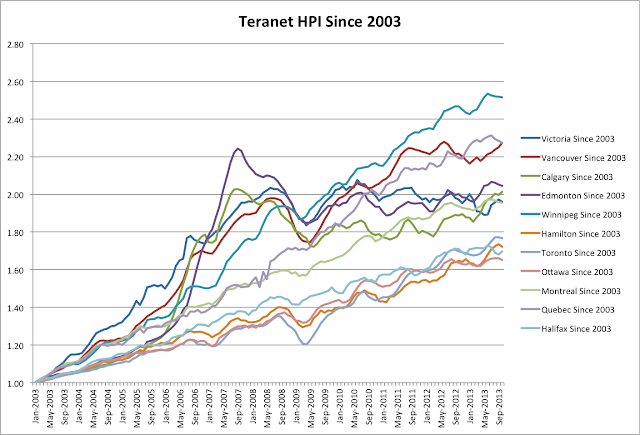 Since 2008 we are the second weakest market in the country. If we look back 5 more years the picture changes a bit. 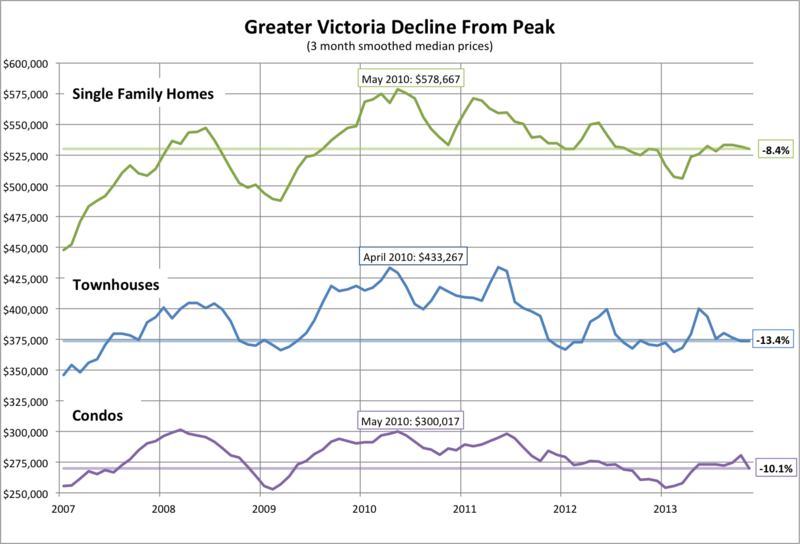 We can see that Victoria along with the rest of the west got a little overly exuberant in the years leading up to the financial crisis. The relaxation of credit seemed to have no effect in the east, while over here it drove prices very quickly. Back more until 1999 (the earliest year of data for many cities). This shows the entirety of the boom for Canada. After our extended flat period, we are on the middle to lower end. Hamilton, Toronto, Halifax, and Ottawa have appreciated less in 14 years, while the rest appreciated (relatively) more. Back to 1993, we are once again the weakest link. In other news the November update is out. The VREB is a sad panda because sales aren't quite as rip roaring as they have been. What with last month's discovery that prices are actually down instead of flat, they are struggling to find something positive to say about November numbers. Well at least prices are up since 2005! 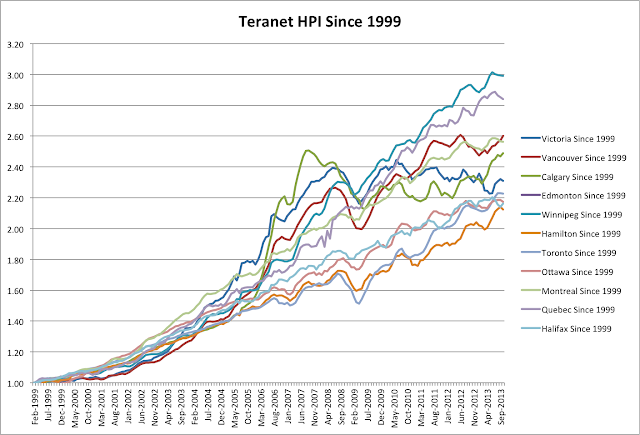 "This represents a 36.5 per cent increase since January 2005, when the index was 100". Funny the headline still says prices are flat, when the article goes on to elaborate that SFHs in the core are down 1.65% from last year, in the peninsula they are down 2.57%, and SFHs in the west shore are down 5.94% in one year.